You are currently browsing the tag archive for the ‘table arrangements’ tag. Making floral arrangements is one of my hobbies, one of the reasons I became interested in gardening. The forms, colors, textures and scents bring me such emotional pleasure. Every time I make one, I wonder why I chose this particular flower. The pictured arrangement was for a Christmas home tour, and I know I wanted a frosty winter feeling, so white roses just seemed natural. 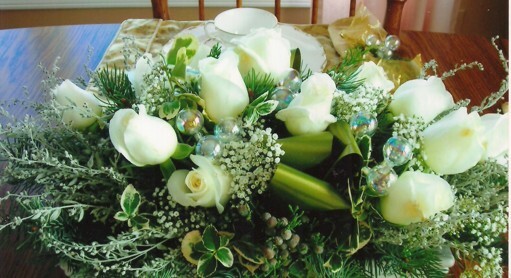 I”m sure you have noticed how flowers are used in all our celebrations and ceremonies. We use flowers at church services, weddings and funerals. Parties, banquets and guests coming for dinner require floral centerpieces. We give congratulations with flowers. A blanket or red roses covers the derby winner, and Miss America also receives red roses when crowned. We give sympathy and condolences with flowers. Everyone receives flowers when grieving, or while in the hospital, or for celebration of a birthday, new home, new job, or retirement. Every holiday has its plant or floral association. The only ceremonies I can think of that don’t are baptisms and graduation, but perhaps that oldish custom of corsages? Florists are correct when they say we celebrate with flowers, and they certainly encourage us to spend freely. And while many arrangements have changed to plastic or silk flowers, nothing gives such pleasure as fresh flowers; still, why flowers? The giving of flowers and their use in all our rituals comes from ancient customs, usage so lost in time its roots are forgotten. Certainly in the beginning flowers symbolized fertility, but slowly the meaning evolved to encompass much more. That flowers were used in the most ancient of burial rites is known. The Babylonians, Egyptians, Greeks and Romans celebrated with flowers, as did the ancient oriental cultures. Victorians codified the meaning of flowers, probably based on much earlier usages. If you want to find all the meanings, just get on the Internet and type in ‘flower meanings,’ or ‘flower language.’ Some have to have been recently devised. Who knew giving bells of Ireland meant you wished the receiver good luck? Or that a cactus plant represented giving endurance? And how did the cattail come to represent peace and prosperity? It’s all very confusing. Flower usage changes over time. For many years white gladiolus were know as funeral flowers, now it’s the calla lily. I’ve seen calla lilies used in more weddings recently, too. Roses and carnations were traditional wedding flowers, but now anything the bride wants is used, often orchids, but occasionally even more exotic selections like bird of paradise. If you pluck a daffodil blooming in your garden and give it to someone, it can tell of your regard, or of your unrequited love, or that individual is the only one for you. However, in mythology, Narcissus was a young man who saw his own reflection in a pool and fell so deeply in love with his image he stared at it until he turned into a flower. Narcissism is not a good quality to have and yet Narcissus is the botanical name of the wonderful daffodil genus. Send daffodils and you might be giving a mixed message. Perhaps it’s better to just forget the language of flowers and give a bouquet of daffodils with the simple idea of bringing some springtime sun into someone’s day, or place flowers on the Christmas table to let your family or guests realize this meal is a very special occasion, so mind your manners, enjoy the company and food, and reflect upon the true beauty of the world as displayed in flowers.